CIO Staff | Office of the Chief Information Officer, U.Va. 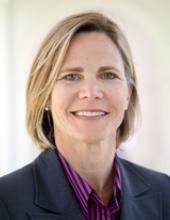 Virginia Evans is the Chief Information Officer (CIO) at the University of Virginia, where she is responsible for planning and delivering central IT infrastructure, applications, and support, as well as information security and IT policy for the University. Prior to her current appointment as CIO, Ms. Evans was the Associate Vice President for Information Technology Services (ITS) at the University of Virginia. Ms. Evans has over 30 years of IT experience, ranging from IT consulting with Andersen Consulting and independent IT consulting, to over 25 years managing IT at the University of Virginia at both the central and school levels. She holds a B.S. degree with a concentration in Accounting from the University of North Carolina at Chapel Hill and an M.S. degree in Management Information Systems from the University of Virginia's McIntire School of Commerce, where she has also served as an adjunct professor, teaching classes at the graduate level.